The Rochester YellowJackets represent the best of our University. The group’s success on the NBC television show The Sing-Off was the culmination of an extraordinary year. 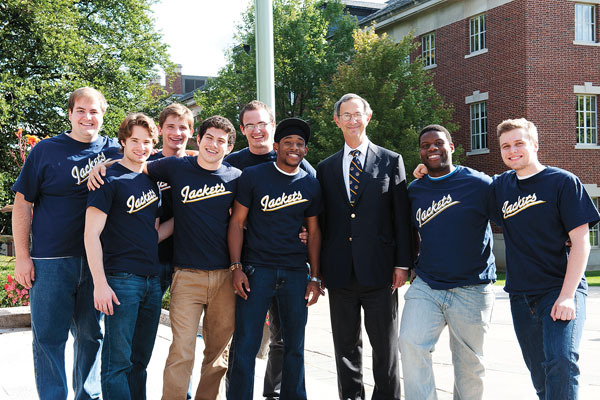 For those of us who have been able to enjoy their performances on and off campus, it’s clear that the Jackets exemplify what’s special about our University and our approach to undergraduate education. They are interdisciplinary: United by an interest in music, the members of the group include a wide range of majors in the College, students enrolled at the Eastman School, and graduate students pursuing degrees at the Simon School and the Warner School. They are community-minded: The Jackets raised money on their own to travel to the village of Maseno, Kenya, so they could establish a musical exchange with students there. As YellowJacket and KEY Scholar Aaron Sperber puts it: “We’re pretty passionate about how music can bring people together.” Aaron, who’s an applied music major at Eastman and an international relations major in the College, organized the YellowJackets as volunteer musical mentors, helping vocal students at World of Inquiry School No. 58 of the Rochester City School District with their goal of establishing a music program. They are entrepreneurial: Like all student groups recognized by the Students’ Association, the YellowJackets are responsible for budgeting their resources, their time, and their energies to accomplish the goals they have set for themselves. The YellowJackets are continuing to put together a documentary, titled United We Sing, which will tell the story of their work in Kenya. 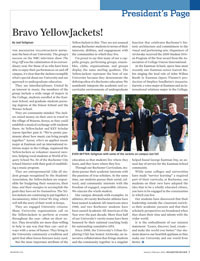 They are engaged University citizens: Many University organizations call on the YellowJackets to perform at events throughout the year—often on short notice. They invariably are more than willing to help in any way that they can—and always with a sense of humor. They bring to the University community a tradition and spirit that often leaves listeners teary eyed. But the most important attribute of the YellowJackets is this: They are not unusual among Rochester students in terms of their interests, abilities, and engagement with the communities in which they live. I’m proud to say that many of our a cappella groups, performing groups, ensembles, clubs, organizations, and groups display the same sterling qualities. The YellowJackets represent the best of our University because they demonstrate the defining ethos of a Rochester education: We seamlessly integrate the academic and cocurricular environments of undergraduate education so that students live where they learn, and they learn where they live. Through our Rochester Curriculum, students pursue their academic interests with the passions of true scholars. At the same time, our students pursue their social, cultural, and community interests with the freedom of engaged, responsible citizens. We educate the whole student. Our campus abounds with examples. In athletics, 80 varsity Rochester athletes have been named Academic All-Americans since 1980, and two Rochester students have been named Academic All-American of the Year over the past decade. More than half of our University’s varsity teams have been honored by their national coaching body for outstanding cumulative GPA. Since 2008, the University’s Urban Exploring Club has hosted ArtAwake, an innovative collaboration that brings students and the community together in a singular function that celebrates Rochester’s historic architecture and commitment to the visual and performing arts. Organizers of ArtAwake received the 2009 Student Driven Program of the Year award from the Association of College Unions International. At the Eastman School, opera fans most recently saw Eastman senior Garrett Rubin singing the lead role of John Wilkes Booth in Eastman Opera Theatre’s production of Stephen Sondheim’s Assassins. Garrett, a voice major at Eastman and an international relations major in the College, helped found George Eastman Day, an annual day of service for the Eastman School community. While some colleges and universities have made “service learning” a required part of their curricula, at Rochester, our students on their own have adopted the idea that to be a wholly educated citizen, you have to be engaged in the communities in which you live. Our students have discovered that their leadership outside the classroom enriches their academic pursuits and that their scholarly perspectives are broadened when they share their time and talents with the wider world. It is the embodiment of our mission statement: “Learn, discover, heal, create—and make the world ever better.” Our students deserve our heartfelt applause as they make our University and our world Ever Better.